IPS or TN? Which monitor panel type should you buy? 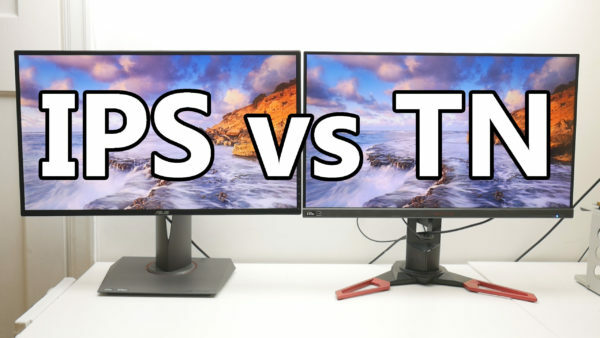 Recent advances in IPS LCD panels have meant we can finally buy fast refresh rate gaming monitors that have the image quality of IPS and the responsive feel that has up until now only been available with TN monitors. But what actually are the image quality benefits of going for IPS over TN, and are there any downsides? Well let’s take a look. Here I’ve got the Asus PG278Q, a 144Hz, 27in gaming monitor that uses a TN panel, while on the right is the Acer XB271HU, a 165Hz, 27in gaming monitor that uses an IPS panel. Now if we just look at raw data from testing these screens with a colorimeter, which measures just a small patch of the screen at a time, both monitors look impressive. Both have around 1000:1 contrast ratios, fairly accurate colour temperatures, good colour space coverage, you get the picture. So if they are both good according to those test, where do they differ? Well, the single most obvious advantage of IPS panels over TN ones is better viewing angles. It’s basically the reason IPS was invented. View an IPS screen from pretty much any angle and it has consistent looking colours. In comparison TN panels tend to be okay when moving from left to right but if you move up or down there’s a very rapid change in the accuracy of colours, and at extremes colours can just go completely bonkers. Also, if you poke an IPS screen it doesn’t distort like TN panels do, which obviously makes them far better for any touchscreen devices. IPS screens, though, aren’t completely perfect when it comes to viewing them off axis. They suffer from what’s known as IPS glow, which is where, past a certain angle the screen, although the screen is still showing accurate colours, it allows some of the raw white backlight to shine through. At extreme angles it can completely cover the whole screen, but it’s more often a problem when viewed straight on and you just get enough of an angle from your eyes to the corners of the screen that you can see a bit of glow, which can be distracting particularly when watching widescreen video. This is distinct from backlight bleed, which looks similar but tends to be less uniform, is constant from every angle and can affect any panel type. Now some people find IPS glow hugely distracting but for me I find it far less annoying than the wavering colours of TN. Instead, the big advantage of TN has traditionally been that they refresh faster and can have response times of just 1ms. In comparison traditional IPS screens have a response time of 10ms or more. However, these new IPS panels have a response time of 4ms or less. That still gives TN the edge, and the difference is just about perceptible but you really are only talking about the very most elite that may benefit or even notice. Crucially there’s no visible ghosting or smearing, which is the key problem with slower response times. In contrast, the AOC C3583FQ that uses a 165Hz MVA panel and also claims a 4ms response time, I found suffered from noticeable ghosting that significantly took away from its appeal as a gaming monitor. All of which brings us to the final, and arguably the biggest, difference between IPS and TN panels, which is price. IPS is simply more expensive. In some cases a lot more. The Asus PG278Q that uses a TN panel is essentially identical to the Asus PG279Q that uses an IPS panel, and yet it’s well over £100 cheaper. And that’s entirely typical of the sort of saving you can expect. So that’s kind of it for the differences between IPS and TN. There are other things you’ll want to consider when buying a monitor, such as connectivity, whether it has height adjustment, whether you need a high refresh rate, input lag, and much more, but they aren’t specifically to do with the panel type. There are also other panel types, most notably the various VA or vertical alignment variants such as MVA and PVA, and there’s Samsung’s PLS. But in terms of buying a fast refresh rate gaming monitor right now it’s basically IPS or TN. So which will you choose?